Arctic Tern is one of six species of tern which have been recorded on Arran but it is the only one that breeds here. Up to the end of the twentieth century, there was a colony on the west coast and one on Pladda. Now only the one on Pladda remains. In 2012 the maximum number of birds recorded was nine. Primarily a marine species throughout its world range, in Scotland most breeding colonies are on the coast, often on small rocky isles and skerries but also on the beaches of larger islands and the mainland. The strongholds of the species are in Orkney and Shetland where some colonies hold thousands of pairs. Between the national seabird censuses of 1987 and 2000 the population had decreased by 34%. This is mostly attributed to changes in the availability of sandeels, the main food source. Arctic Terns are famous for undertaking the longest migration of any bird. One bird ringed as a chick on the Farne Islands off the north east coast of England in June 1982 turned up in Melbourne, Australia, 22 000km by sea, in the October. Some individuals travel from the Arctic to the Antarctic and back again over the course of a year, a distance of around 40,000km. Their migration means that they never feel the full effects of winter - when the northern hemisphere experiences its winter months, the birds are in the southern hemisphere, and vice versa. 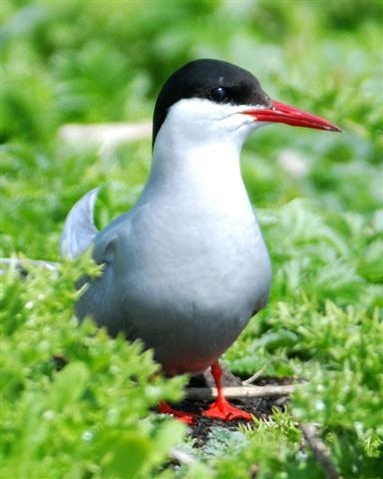 Arctic terns breed in northern latitudes such as the UK, as well as in the Arctic circle. They are long lived birds with some known to be over thirty years old, so the life time travel distances are huge. 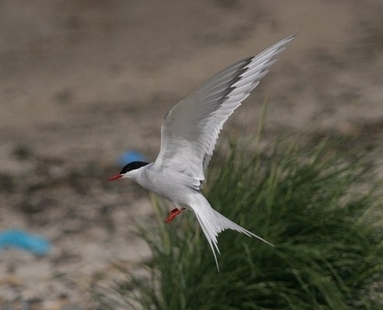 Look out for Arctic Tern fishing along the southern shores of Arran this summer and reflect on this remarkable bird. With its long tail streamers and general shape the Arctic Tern deserves the name of 'sea swallow'.